In the last week of term it was once again cultural week. This term we all went Italian, learning vocabulary and making a wide range of Italian foods. The highlight of the week however was undoubtedly the trip out to Zucchinis restaurant in Helston. 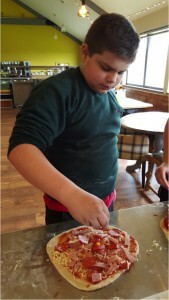 The owners of the restaurant very kindly opened just for Oak Tree School pupils on their day off, to allow us to come in and learn to make real Italian pizzas with their chef – a third generation pizza chef from Italy! 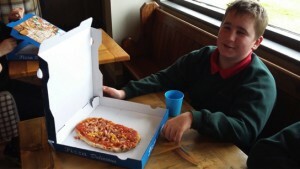 Students went throughout the day in different groups, made their bases, chose their toppings and then had their pizzas cooked while they waited, before sampling them in the restaurant surroundings. Students and staff then had the extra bonus of being served home-made gelato for desert! The food was all fantastic and we are so grateful to the restaurant for stepping in at the last minute to let us have this amazing experience, and at no cost either! We would highly recommend this restaurant to any pizza lover!